With USB-C getting more and more popular, some of you power users might want to measure the rate at which your devices are charging. Earlier this month, Satechi released a USB-C power meter that Jordan had some hands-on time with. 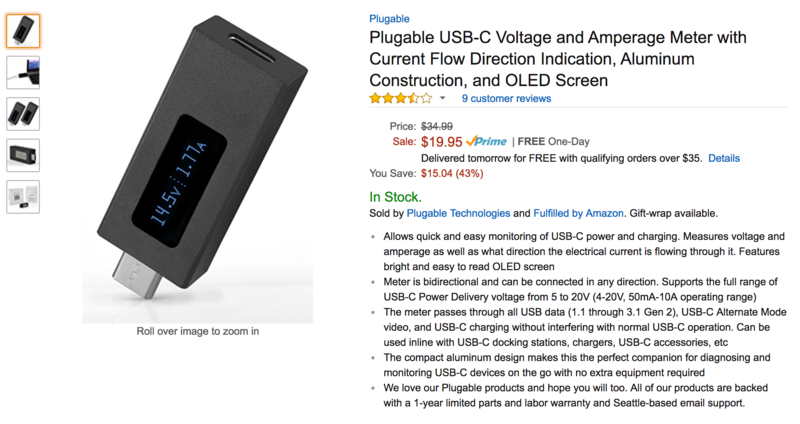 However, Plugable sells one as well, and at its current price of $17.95, it might be worth picking up if you like to check this kind of stuff. Basically, this little tool allows you to monitor USB-C charging rates in both directions. It has an OLED display to clearly show the stats, and a chunky aluminum body that, while not as attractive as the Satechi's, gets the job done. It also comes with a one-year warranty. Artem actually compared this one with Satechi's, and while he liked the Satechi more, the Plugable wasn't at all bad. The on-sale price of $17.95 is $17 lower than the MSRP, and $7 less than it usually goes for. If you want one, just hit the Amazon link in the source below. We don't know exactly how long this deal will run for, so don't snooze if you're interested.